A 1:1 scale replica of a Sig Sauer pistol, the SP2022 CO2-powered pistol is remarkably authentic. 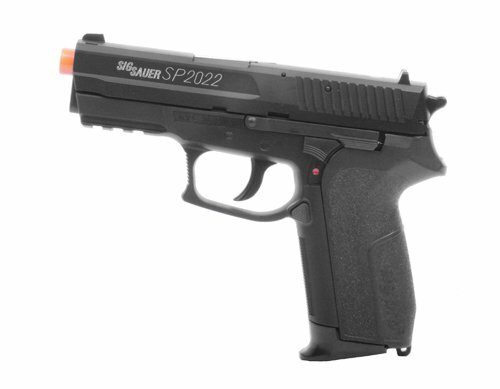 Like all airsoft guns, the SP2022 fires small plastic pellets known as BBs, which are propelled out of the gun via a CO2-powered mechanism. The advantage of the airsoft pistol, however, is that players can safely train, simulate, or play with the gun without fearing serious injury. The SP2022 looks, feels, weighs, and functions just like a real Sig Sauer firearm, but is built for casual recreation rather than weaponized use. In fact, the only way you can tell a real steel firearm from an airsoft pistol is the blazing orange tip and the BBs that fire when you pull the trigger. The SP2022 offers such features as a versatile BAX hop-up system that lets you adjust your shots and increase your distance, a low tactical rail for attaching accessories, a velocity of 380 feet per second with 0.12-gram BBs, and a magazine load of 15 rounds. Can’t Find What You Are Looking For Yet? Just Click The category of your Choice Or Search for Anything You Want And Unleash Yourself. This super store will find you anything you want at the lowest online prices. Shop here safely, quietly and piece of mind with people that care.